On June 17th, Andrei Secea spoke at the Rise of the DevOps conference in Timisoara, Romania. Rise of the DevOps is a conference aimed at the growth of the DevOps community in Romania. It was hosted by 3Pillar Global at the Incuboxx, Timisoara on June 17th, 2017. 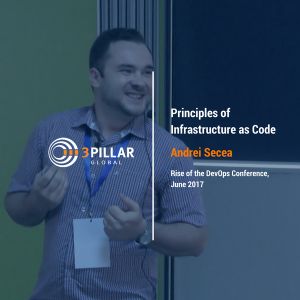 In the presentation, titled “Principles of Infrastructure as Code,” Andrei began with an introduction of Infrastructure as Code from the DevOps movement. He followed this up with an automation as a service use case to explain its advantages to both developers and users. He then gave a brief description of what Docker is and some of its advantages, like Container-as-a-Service, Selenium Microservice, and Testbed-as-a-Service. At the end of the presentation, a brief Q&A session was held. Andrei is a Technical Manager at 3Pillar Global. With more than 10 years of experience in automation and CI, in his current role, he drives the architecture design and development of an Automation PaaS (Platform as a Service) for one of the leading companies in network security. His curiosity and passion for Linux, networking, and programming give him the skills to not only excel at what he does but also to coach others.